Edit: You can now find the pattern here! Over the summer I bought a whole bunch of yarn on clearance at Michael’s with the intention of making myself a sweater. 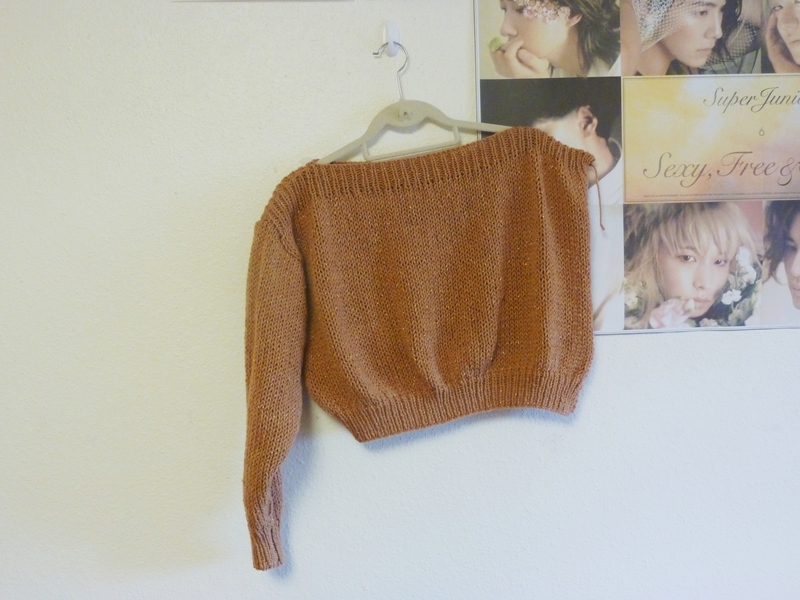 At that time I had never made a sweater before and for all you knitters out there, you must have some understanding at how some large project like a sweater might be a little intimidating, especially if it’s you’re first of its kind. I wrote up this inspiration post and started my journey on finding the perfect pattern. As it turned out, I had to do a little improvising like a lot of my knitting because for some reason, me and knitting patterns aren’t really close friends. We hang out every once in a while but I like to go my own ways a lot of the time. I ended up choosing the pattern for the boatneck sweater in my vintage Vogue Knitting, however, I didn’t have enough yarn and since the yarn I bought was in clearance, there was no way of knowing that there would be any of the same kind left. Lesson #1: Pick a pattern before your yarn (and needles, too) if you want to make something exactly as it says in the pattern. Otherwise you end up improvising and modifying like I always do. So I had 3 skeins of the sparkly, beige yarn. My first thought was to knit it on bigger needles for it to knit up quicker and to use less yarn. Now I had to modify the pattern. The cool thing was that this Vogue Knitting is full of modular sweater patterns, which means you take your measurements and fill in the number for a perfect fit. I had to do one of my most often skipped steps of knitting and measure my gauge. The details are very fuzzy now, since I fixed the pattern over the summer, but somehow I went from there and decided that with my gauge, following the Children’s size (for stitches) rather than Women’s would make for a sweater that fit. 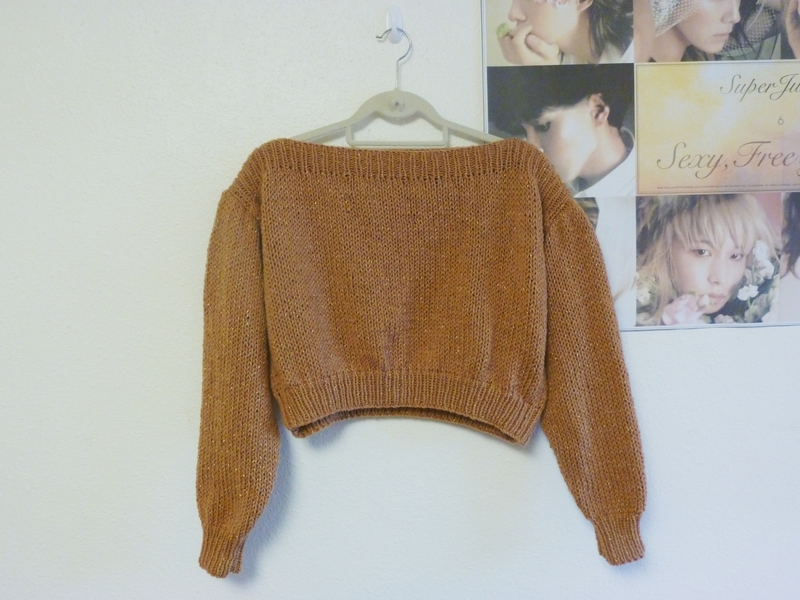 And since I still wouldn’t have enough yarn, I decided to make a cropped sweater rather than a full length sweater and I had the option of either going 3/4 sleeve or full sleeve depending on how much yarn I had by the time I got to the sleeves. 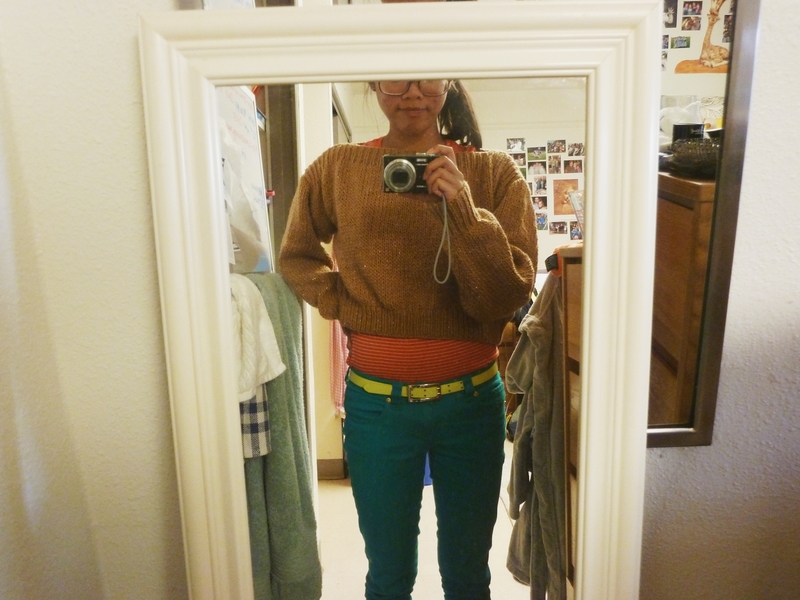 I was aiming for an oversized sweater, but when you improvise, you have to compromise. And it worked out, thankfully! Luckily, I was able to find the same yarn when I went to a different Michael’s to buy some other things and bought another skein so I was able to do full sleeves. So I started the sweater over the summer and got interrupted by one of my high school friends asking me to make her a sweater, band camp, marching band, and school in general. One of the great things was that the newly created knitting club at my university allowed me to have at least one hour every two weeks to just focus on my knitting. And after one long, hectic week last week, I was happy to just sit in my room, relax, watch some TV, and knit. Oh, you know me, party all night long! That led to my sweater update. Now that I was on a roll, I wasn’t stopping. At knitting club last Thursday I finished knitting the last sleeve and went back to my room wove in the ends instead of finishing an essay I still haven’t finished. I blocked it, with the intention of finishing the sweater that night but seaming, my least favorite activity wouldn’t cooperate. As you can see all it takes is 2 rectangles and 2 trapezoids. 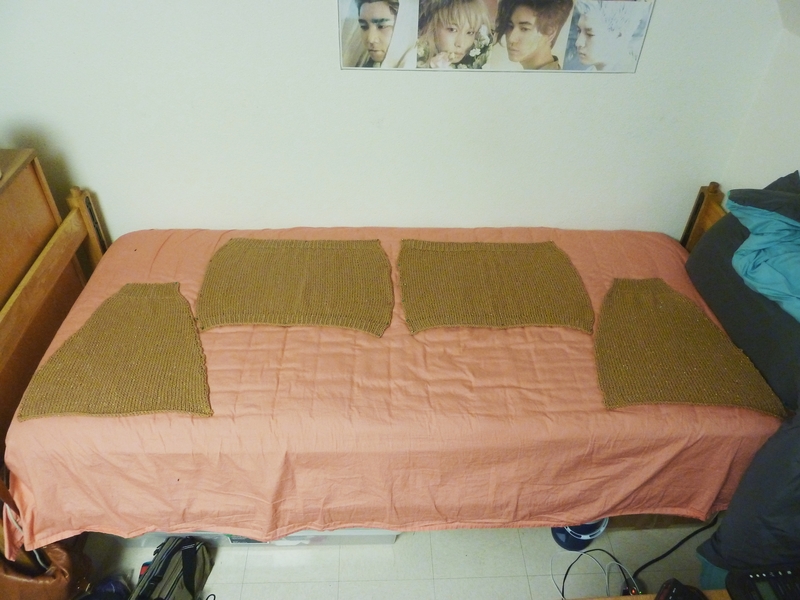 Lesson #2: Mattress stitch is the best stitch ever. It allows for invisible seaming and works like magic. I began seaming my sleeves but I’m not too careful with it so my ends did not match so I undid it and finished my seaming Friday. Here are some photos of the gradual process. Say hello to my arm because I only have one sleeve sewn on! Oh hey it’s me again, wearing the completed sweater. TA-DAH! I’ve garnered some interest for the pattern on my Tumblr when I posted an Instagram of this sweater so I’ll be working on writing an understandable pattern. This is also an exciting new step in my knitting – writing patterns for other people to use! I can’t wait to wear this sweater! Unfortunately the weather in Delaware has been unpredictable and it has been feeling very un-fall-like lately. 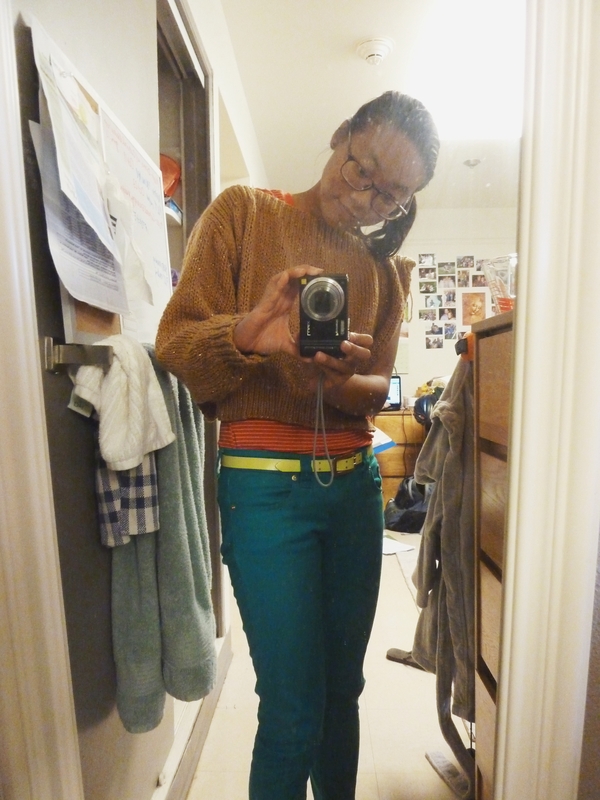 Hopefully the weather will cool down and I’ll be able to show you guys this sweater in action. « My name is Vi, and I’m a Goodwill shopaholic. Hi Vi! My name is Monica and I’m leaving you a message from chilly/rainy London Ontario Canada. I found your pattern through Ravelry.com when trying to find a sweater that I can make with worsted weight wool and with raglan style sleeves. My question to you is what ladies size are you? 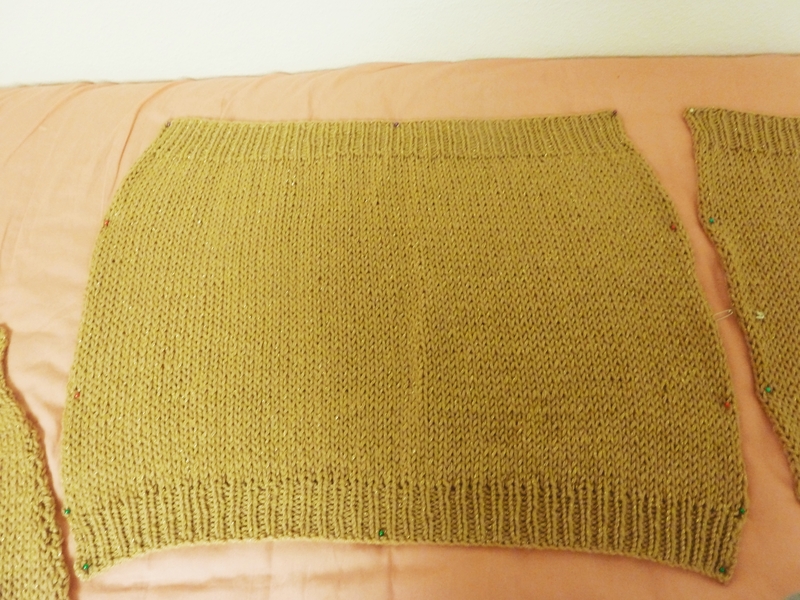 Reason why I ask is because I suspect that I may want to add stitches to the width and length of the body and sleeves. I’ll understand if that’s too personal a question! I am a ladies Medium or size 10 – 12. I think this is a fairly forgiving pattern, and I’ve already added 5 stitches to the first piece I’m knitting (one of the body “panels”). I’ll let you know how it goes. Thanks for posting! I’m fairly petite so I would usually wear a small (size 2-4). If you need some help with adding the right number of stitches here’s a tip about using your gauge: Count how many stitches you have per inch and for every inch you want to add on, add that many number of stitches. 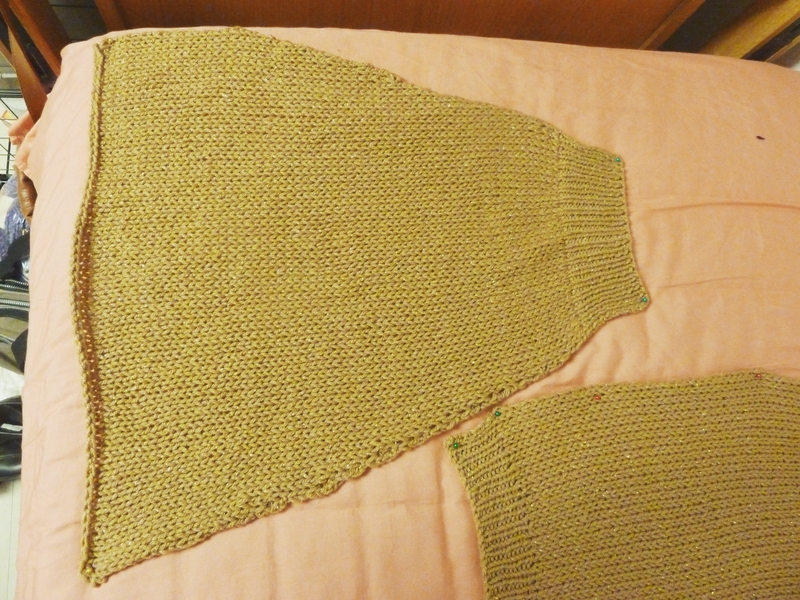 Now, this requires knitting up quite a few rows for the gauge to be accurate so you might want to do a swatch of about 20 stitches by 20 rows, but it will benefit you in the long run to have a garment that is the right size. Excellent, thanks! I will be sure to post a pic when it’s done. Thanks again!